Hoje eu falo sobre uma tentativa dos correios daqui de me entregar uma compra que fiz online outro dia. Eu não estava em casa, e então eu comento quais são as opções para pegar o pacote. Veja e ouça o vocabulário e collocations específicos para essa situação: Royal Mail, delivery attempt, “Something for you” card, arrange redelivery. What’s up, everyone? You’re listening to the new episode of the Inglês Online podcast. Thank you for telling everyone you know about this podcast and, enjoy! So as I’m here with my laptop open on… my lap, thinking about what my next podcast is going to be about, I decide to check the Royal Mail website and see where my new boots are. Let me explain: the Royal Mail in the United Kingdom is equivalent to our Correios, or the Post Office in the US. A few days ago I ordered a pair of boots off the Internet, and a postal worker should be delivering them any day now to my place. So I’ve literally just gone to the Royal Mail website right now and typed in the tracking number the shoe shop provided me… and there it is: a Royal Mail worker tried to find me fifty minutes ago at my place, and I wasn’t there. I’m here, at a coffee shop. It’s ten past one in the afternoon now, and for the last several weeks I have always been home at this time.. but today I decided to leave earlier than usual and grab a cup of coffee while writing the podcast. Obviously, that was enough to set Murphy’s Law into motion and bam! That’s when the delivery person showed up. Bummer. So this is what happens now: the delivery person has hopefully left me a “Something For You” card – that’s a small card that lets me know a delivery was recently attempted. After twenty four hours – which in this case is tomorrow around 1PM – I could go to the nearest post office carrying the card and some ID, and pick up my boots. There’s another option, though: instead of going myself to the post office, I can arrange a redelivery by either calling up Royal Mail or clicking on a button on their website. You can see what I’m talking about if you look at the screenshot I’ve included in this post. 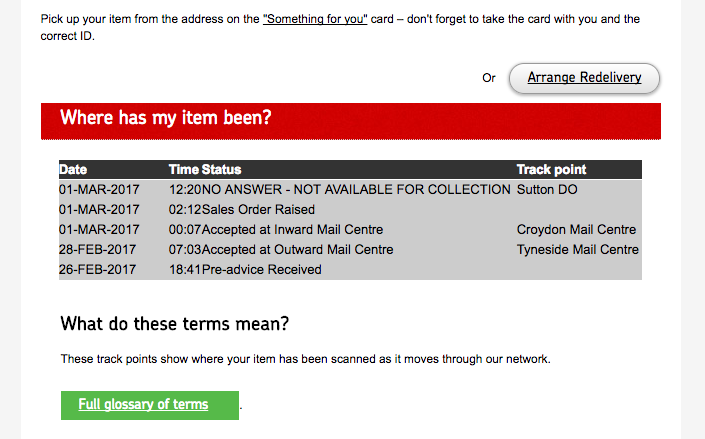 Rearranging delivery is a nifty little feature of Royal Mail that I have used before – this isn’t the first time I’ve missed a delivery – and I’m probably going to use it again now. So I’m going to click that button and enter some details from the “Something For You” card, and then choose a date for redelivery. Only, this time I’ll make sure I’m home ’cause I don’t want to miss it again! So what happens in Brazil right now if you miss a delivery? I remember the postal worker used to make three attempts at delivery before returning the package to their warehouses. Do they still do that? And what happens if you miss delivery all those times? Should you go to a Correios office with the Brazilian version of the “Something For You” card and your RG to pick up your package? I don’t think I ever had to do that when I lived in Brazil – let me know if you’ve done it… and talk to you next time. Olá Ana Luiza, estou fazendo um trabalho sobre a aprendizagem do inglês on-line e gostaria de citar o site Inlgês Oline, para isso gostaria de saber uma pequena biografia sua, como a cidade de origem no Brasil e onde está morando agora. Em um dos postes eu já ouvi mas não me lembro. Por favor, me contate através do meu e-mail. Que bacana :-) Como o José Antonio recomendou abaixo, aquele podcast é a melhor fonte pois lá eu digo tudo isso. Abs e sucesso com seu trabalho!